As I think about glyphosate tolerance/resistance, going back 20 or so years in my career in agronomy, it has mainly been a problem faced by farmers south of where I have been, whether it be western Iowa or here in east central Iowa. We have known for several years that weeds (waterhemp especially) have been getting more difficult to control with glyphosate. In my mind, I have had doubts about full-blown resistance in this area, perhaps due to too low of a rate for the size of the weed, environmental conditions at the time of application, or possibly antagonism with a tank mix partner. I had a situation this spring that convinced me we are now dealing with metabolic resistance to glyphosate. 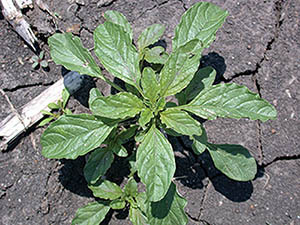 Some individual waterhemp plants can metabolize the glyphosate just like Roundup Ready corn and soybeans do. We had our residual product break on the end rows of a corn field in a high-pressure area, but the corn was too small (V2) to chance spraying the planned post emerge pass and hope for that layered residual to last until canopy. I loaded the sprayer with 64 oz/A of glyphosate and the maximum rate of adjuvants permitted by label. I was targeting ¼” to ½” tall waterhemp and sprayed the end rows and came back in a week to check the effectiveness. What I found was about 65% control, about 15% were beat up, and the last 20% were as healthy as the day I sprayed them. Thankfully, our planned post emerge pass was with a dicamba product and we were able to control the survivors. We are fortunate, for now, to have post emerge options for control in corn. Soybeans present us with a different challenge. As well as resistance to glyphosate, many have developed resistance to group 14 PPO products (Flexstar®, Cobra®, Cadet), which leaves us no effective mode of action post emerge other than the Roundup Ready 2 Xtend® platform on problem fields. There are three products labeled to spray on Xtend soybeans: Xtendimax® with vapor grip technology by Monsanto, Fexapan™ with vapor grip technology by DowDupont, and Engenia™ by BASF. Preplanning for use of these products is critical as each have a different set of approved tank mix partners for residual chemistry. Downwind buffers must be maintained at 110’, application must take place when wind speeds are between 3-10 mph, application must take place during the daylight hours and at no more than 15mph ground speed, keeping the boom at 24” above the target. We are required to use approved drift reduction agents (DRAs), approved nozzles, and cannot use a tank mix partner that is not approved. A full list of requirements can be found at http://www.xtendimaxapplicationrequirements.com, www.dupont.com/products-and-services/crop-protection/soybean-protection/articles/fexapan-application.html, and www.engeniatankmix.com,depending on what product you choose to use. While complying with the requirements is a tedious and cumbersome task, it is something we must take seriously and make every effort to do. November 9th, 2018 is the review date for the Xtendimax® label and if this year doesn’t turn out substantially better from a complaint standpoint than 2017, there is a real possibility that the EPA will not renew it. If that happens, the fear is, what will be the incentive for crop protection companies to continue research going forward when they will have just seen Monsanto invest hundreds of millions of dollars only to have their technology unusable in just two years. I believe River Valley Coop is uniquely capable to perform this task while staying within label requirements because of our large fleet of application equipment and our professional applicators, our ability to move them to where the work load is the heaviest, and our trained agronomists scouting to ensure the weeds are within label height.